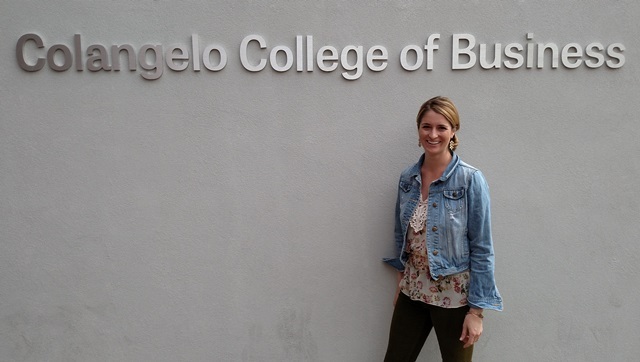 Courtney Klein, a member of the CCOB advisory board, spoke to students about how she created two startups. The Colangelo College of Business keeps bringing high-profile motivators to speak to students on the Grand Canyon University campus, including Jerry Colangelo himself. Just as important, the message is consistent. 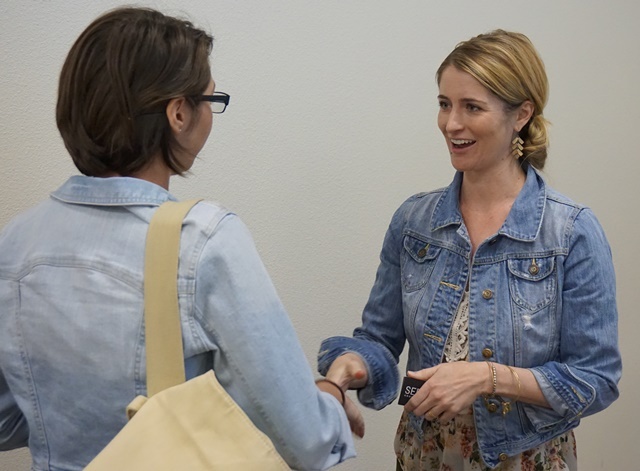 Friday’s visitor was Courtney Klein, the 31-year-old founder and CEO of Seed Spot, the nonprofit Phoenix business incubator that trains prospective entrepreneurs who aim to solve societal issues. It was another opportunity for students in the CCOB lecture hall to hear from a highly successful entrepreneur not much older than them — Derek Turner, 25, spoke to them just two weeks earlier — and Klein, like Turner, delivered a polished presentation full of good advice. Klein, named one of the “25 Most Dynamic Women in Business” by the Phoenix Business Journal in 2013, emphasized the importance of pursuing your dreams no matter how lofty they might seem at the time or how incomplete your plan might be. The key, she said, is just to start somewhere and see where it takes you. In her case, she said she was determined to be the next Katie Couric while majoring in broadcasting at Arizona State University. But then a mission trip to Mexico’s Yucatan Peninsula, where Klein saw people still holding onto their dreams of new houses despite monumental challenges, inspired her to switch to a nonprofit management major instead. She had a new mission in life: She wanted to devote her energies to helping the younger generation get excited about their ideas. Klein then took students down the winding road that led her to where she is today, incorporating messages such as “Always have a wish list” and “Always pursue the risk” in her absolutes. She turned down three job offers coming out of ASU to focus her attention on opening New Global Citizens, a nonprofit that empowers young people to effect social change. Before long, her startup had merged with a California business doing similar work, and she took over as the CEO. Just as Colangelo, the Phoenix business magnate for whom the college is named, consistently tells students that life is “relational,” Klein advised them, “Build a relationship and the money will follow.” And she backed it up with a story about how she went about pursuing funding from Jerry Bisgrove, a prominent Phoenix philanthropist who is chairman and CEO of Stardust Real Estate Holdings. After Klein gave a speech to a group of Phoenix business people, including Bisgrove, she said he offered her a choice: his business card or his credit card (in other words, a donation). She chose the business card — chose the relationship — and he organized an annual luncheon to help her raise money. “Always take the business card,” she said. She eventually got antsy to leave someone else in charge of New Global Citizens (“I wasn’t the right leader anymore”) and try something new, which led her to Seed Spot. In just three years, she said, the nonprofit has 134 alumni and has helped them raise $1.7 million with $1.4 million pending. Klein spoke with a long line of students after her presentation. It hasn’t been easy. Klein warned students that entrepreneurial ventures can be a lonely existence, filled with part-time jobs to make ends meet but devoid of financial security and frequent vacations. She got through it, she said, by having respected mentors who could answer her questions or just listen when she felt overwhelmed. “Surround yourself with good people,” she said. Afterward, she spoke to two other issues: public speaking and dressing for success. She urged entrepreneurs to take public-speaking classes and added, “I think there’s something to be said about dressing to the audience,” noting that she dressed differently for her appearance before students than she would for a meeting with business people. Klein, a member of the CCOB advisory board and also a curriculum consultant, lauded the work the University is doing to teach students about entrepreneurship and said she would love to teach a class. She showed Friday she has a lot to share.